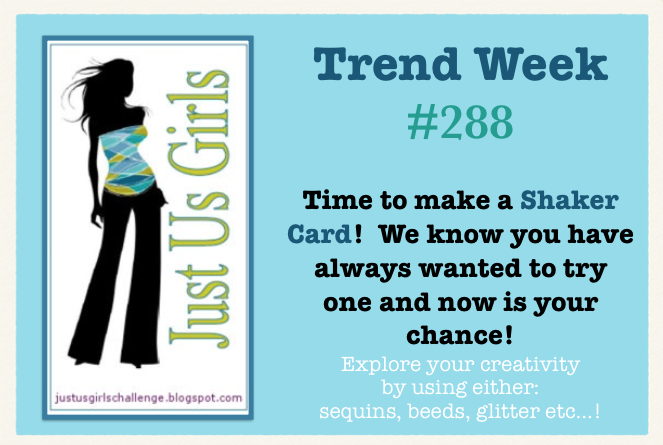 Hi Friends, Today over at Just Us Girls it’s Trend week and Sue has challenged us, and you for that matter, to make a Shaker card. I will admit, I think this is the second time I have ever attempted one of these types of cards, I am not sure why they intimidate me so much, because they are not that hard and so much fun to make! I am also linking my card up to two other challenges. The Pink Elephant; where they are asking us to use Pastel Colors, and my starting off point was a sketch from Freshly Made Sketches. Now head on over to Just Us Girls and play along! While your there check out what the Design Team has done along with our Guest Designer Kathy. Remember, if you are chosen as our Chic of the week you could be in the running as a possible GD in the future. Hope to see you there! Few card details: Flower stamp is from SU. The sentiment is from Verve. I used a combo of Washi tape and ribbon underneath the sentiment. The EF is also SU. Inside the shaker I have a mixture of sequins and punched paper flowers in various colors. Any other questions please just let me know. Categories: Cards | Tags: Card making, Cards, color challenge, rubber stamps, shaker card, sketch challenge, stamping, Thinking of you | Permalink. Fantastic card loved all the elements. Love the stamped tulips in your shaker, so Springy! Also love the background texture which mimics your pretty polka dot ribbon! This is Fun AND Fabulous!!! Very pretty shaker card. Love your design and pastel colors. I need to make a shaker card as I don’t think I have ever made one. Have a great weekend my friend. Great shaker, Nancy. Adding little flowers inside was a great idea. With all the layers and dimension, you should enter this card at Virginia’s View. I love your pretty shaker card. Very springlike! Love the colors you used — very pretty shaker card! Your colors are fantastic…..love the aqua with that pop of yellow. Love those gorgeous tulips too. Beautiful card, my friend! What a fresh and pretty spring card! Such a beautiful shaker card and love the spring look with the flowers and colors! Beautiful card! I love the shaker you’ve made! Such sweet flowers! Great colour choices! Thanks for joining us this week at Freshly Made Sketches! Love the design, the colors and that tulip stamp inside the shaker! Loving the sweet flowers in your shaker card! So pretty for spring! Thanks for joining us at FMS! So pretty! I love those soft, fresh colors and your shaker pieces. So cool that you added the little punched flowers with the sequins. Love that you used an image in the shaker as well. I just love everything about this card. The design is amazing. Love the base of black that accents the tulips and the embossing of the layer to match the ribbon. A very beautiful card that I want to pin. Adorable shaker card Nancy. Beautiful background and love the layout. You always come up with AMAZING! Loving this gorgeous shaker! Those tulips are darling!! 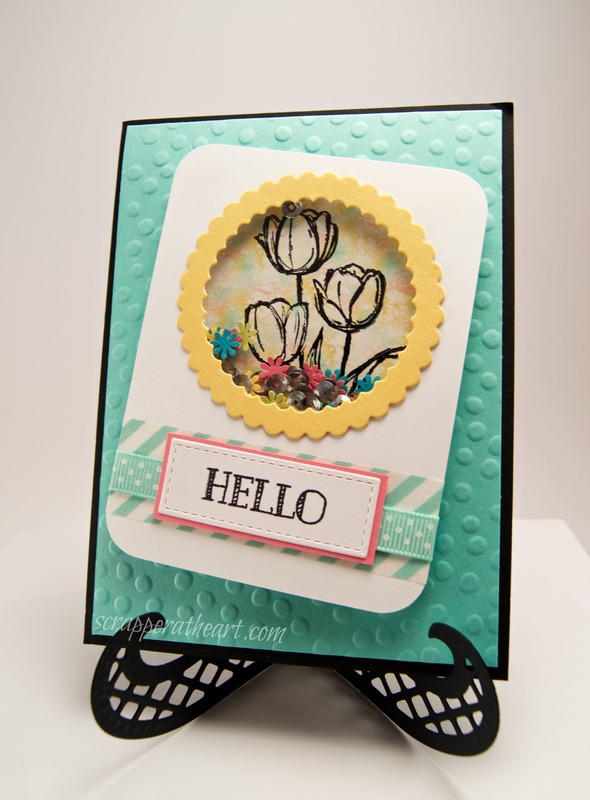 Such a gorgeous tulip card Nancy! Love your take on the shaker style card just fabulous!